Visa QIWI Wallet offers a simple and reliable way to pay for goods and services around the world, receive payments, and transfer money. ∙ Pay for goods and services with about 7000 providers (mobile operators, Internet access, television, utilities), traffic police fines, duties and government services. 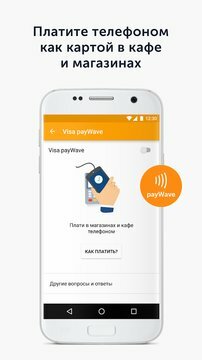 ∙ Issue and pay bills of other Visa QIWI Wallet users and online shops. ∙ Buy airline and railway tickets. 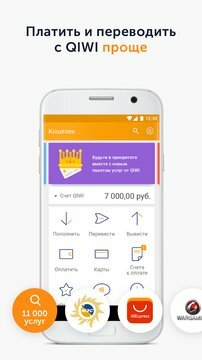 ∙ Transfer funds to other Visa QIWI Wallet users without a fee. 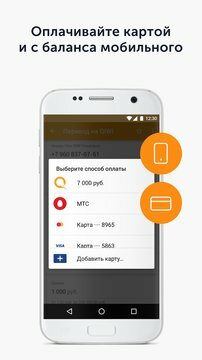 ∙ Withdraw funds from Visa QIWI Wallet to bank accounts and cards, or via money transfer systems. 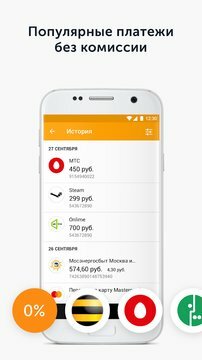 ∙ Use a variety of sources of funds (Visa QIWI Wallet, personal accounts of mobile operators Beeline, Megafon, MTS, or bank cards) and currency. ∙ Issue virtual Visa cards, attached to your Visa QIWI Wallet, for purchases in on-line stores. 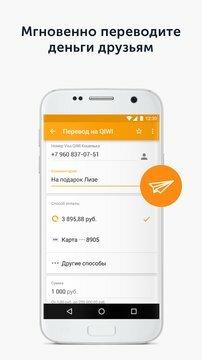 ∙ Learn about the methods, and nearest locations, to top up the Visa QIWI Wallet. ∙ Maintain details of payments for re-payment. ∙ Receive reports and official information. If you do not have Visa QIWI Wallet, you can register free of charge directly from the application. *For some countries, some features may not be available. Updated: 05 сентября 2018 г.